PRODUCT DESCRIPTION: The best overall Tamper proof Bait Station that can be used for either rats or mice. It has many features including a see through top, locking bait bars, replaceable bait trays, dual bait chambers, allen key bolt locking top and large size. Almost twice as big as the standard Tamper proof Station we carry for rats, this unit is able to hold a lot more bait and hold it a lot more securely. The included Bait Bars simply slide through the Bromethalin Bait Blocks and then lock into place inside the bait chamber. This helps to prevent bait removal and relocation by hoarding rodents. 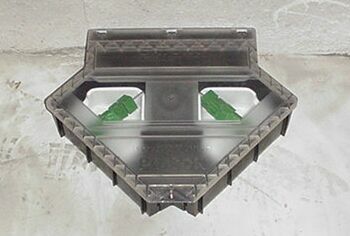 Furthermore, the replaceable bait trays enable you to keep the station clean which is important when you want rodents to return over and over again to key baiting sites. 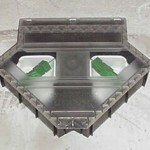 Contaminated stations need to be cleaned and bait needs to be fresh so having replaceable bait trays enables you to accomplish this need easily. The allen head bolt for locking the top down is another advantage since there is no need to equip anyone with a special key that might need to get inside the station. Lastly, the clear top allows for quick inspection to see if you even need to go inside it at all and can save a lot of time and effort reducing the amount of time it will take to inspect several such bait stations. WHERE TO USE IT: Anywhere inside or outside the home and other buildings where an integrated rodent control program is active. Be sure to use the Bait Station Stakes to help secure them that much more where applicable. RATE OF APPLICATION: One station every 10-15 feet is suggested.